Following in the footsteps of competitors Pandora and iHeartRadio, Spotify is launching video ads to help monetize its 30 million consumers who stream digital music. The first brands to run campaigns will be Ford, McDonald's, Coca-Cola, Target, Wells Fargo and NBC Universal Pictures. Soon, music lovers can watch a brand video on Spotify’s mobile app in exchange for 30 minutes of free music play. It's called a Sponsored Session. Brands can also buy a desktop version of the ad, called a Video Takeover. Members of the free service will opt in to watch the ads. And members who pay Spotify’s $9.99 monthly subscription fee won't see the ads. The feature is similar to Hulu’s "Branded Entertainment Selector" video ad where viewers can choose to watch one long ad (as opposed to multiple ads) before watching their show or movie without interruption. "Our audience is incredibly engaged, so we are delivering an advertising experience that enhances their time spent on Spotify and connects them to the music and brands they love," said Spotify CBO Jeff Levick in a statement on the company's blog. Spotify says it will begin testing the ads during the fourth quarter with the initial group of brands. Going into 2015, the format will become available to all marketers. The company tested different timespans for the "Sponsored Sessions," from as little as 15 minutes of music play to as long as an hour, and found that 30 minutes was the sweet spot for the best opt-in rate, reports Ad Age. Levick declined to say how much the ads cost, but he did reveal they are priced at a premium to make up for lost revenue during the half hour free of ads. Digital video will bring in $6 billion this year, according to eMarketer. 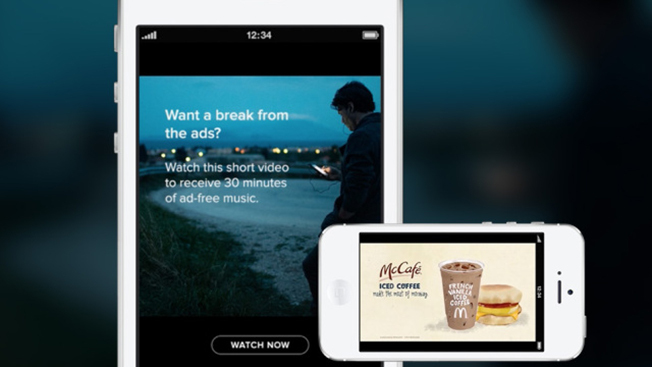 A healthy chunk of that number—$1.5 billion—will come from mobile video ads. "Desktop has historically been the larger source of impressions in terms of where ad revenue is coming from. Mobile in the last nine months has accelerated and become that," Levick told Ad Age.